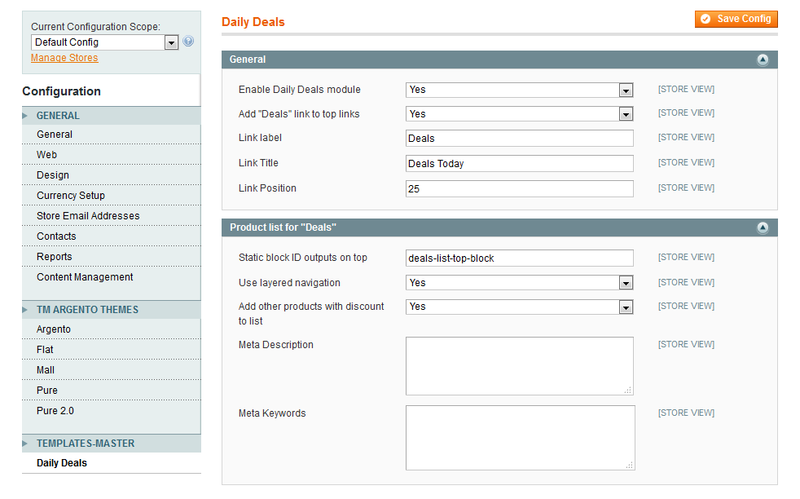 Develop your sales strategy with Daily Deal extension for magento. Let’s offer visitors get joy of shopping online by providing them with the most advantageous deals in your store. 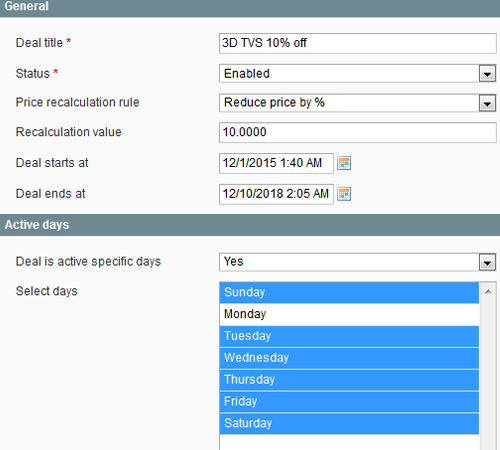 You can utilize our module to notify customers about amazing bargain every day or during specified period of time. Create a new deal, promote one product or more and boost your sales. Allow users stumble upon hot deal displayed as link, label or simple static block all around your magento store. Benefit with our extension! Engage new visitors with attractive daily deal block, get loyal customers satisfied with a discount and increase your revenue. In addition, the extension will help you to create landing page with daily deals that truly leads to conversion rate growth. 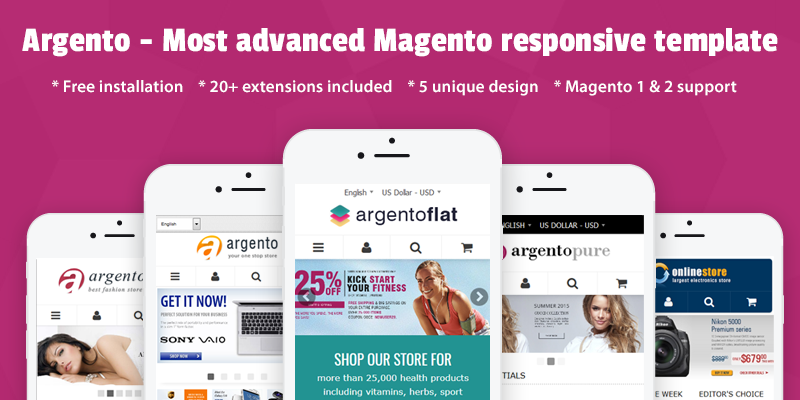 Find out more information and reviews about our module at Magento Daily Deals extension page. Daily deals showcase is good idea for selling off. Create as much deals as you need and run sales. Within the deal configuration you are allowed to edit the start and end time, choose the store view and set up the recalculation process. Specify the recalculation value and apply one of three rules in order to change the product price. You can select from Reduce base price by %, Subtract fixed amount from base price or stay with Fixed price. Afterwords you can assign the deal to any product in your magento store and make the deal periodic by enabling the date and time of deal activity. 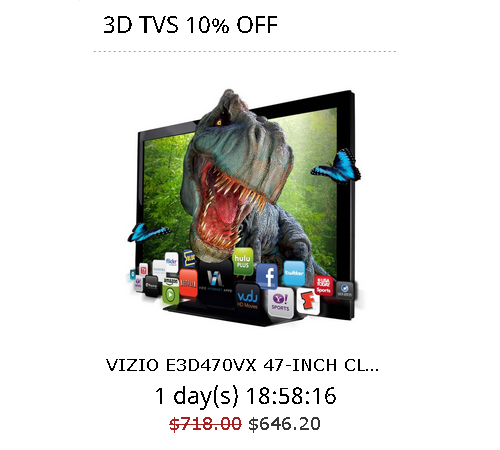 The extension provides you with the optimized showing of daily deals. 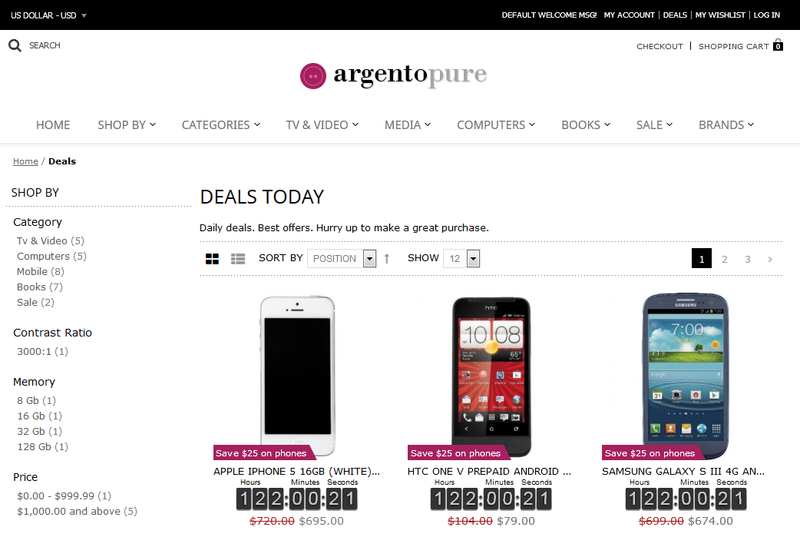 You can post up deal offers listing by using widget anywhere in the store. The information about daily or weekly deals can be output as link that appears in top links at the header. This way store visitors will be redirected to the page where all current deals are listed. One of the easiest way to inform customer about daily deal offer for specified product is to mark it with bright label. 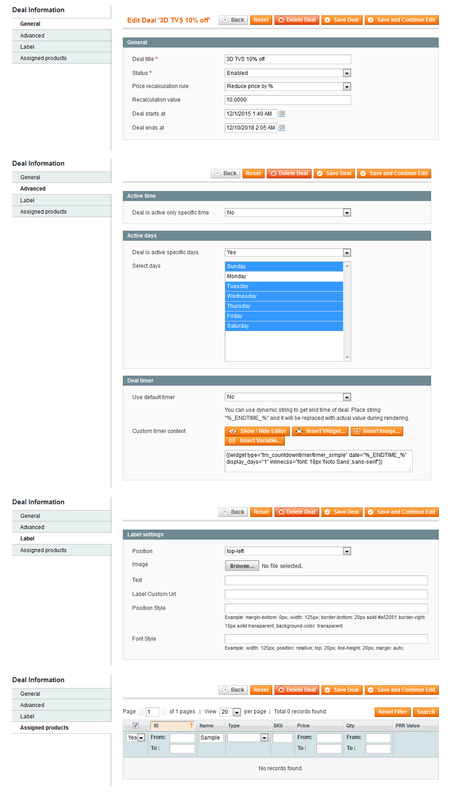 Please notice you can show the label in case your store is powered with our product labels magento extension. It’s pretty easy to manage the Daily Deals extension. You can set up the link title, label and position among top links. Our module enables adding all products with a discount to magento landing page with all deals. You are allowed to specify meta description and keywords for that page in order to get better SEO for your magento store. Share current deals easily and quickly. Our module comes with two dynamic widgets. You can use them separately for random and specific products. Daily deals can be displayed in column and in row. In order to bring special offers output with a new design you can apply CSS class and set various different fonts, change a background and a text. Moreover, feel free to create your own template for deals showcase. This could be specified in widget settings. Our extension comes with built-in Countdown timer module. It enables the setting the limit for deal time. You can vary the time start and time end for different deals separately. 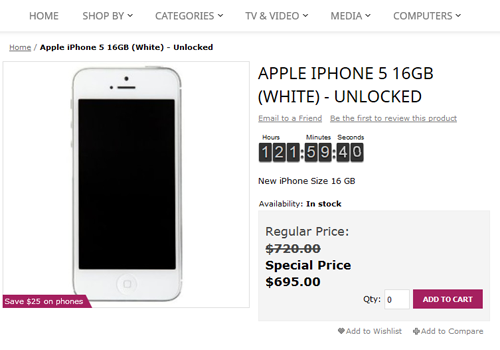 Use countdown timer as powerful trigger to push users to buy in your store today. You can show time notification next to specified products on the category page. Help your customers find the best offer. Countdown comes with 2 widgets. You can show the default deal timer as well as set custom one. This module allows you to add call-to-action title, highlight the discount, tell users about new items coming up, etc. We offer you to impulse SEO with our magento daily deal extension. Create a landing page with store daily deals and other hot offers and get more traffic. In order to please customers you can suggest them products with discount additionally to the deal offer. Adding on sale products is available in extension configuration. Using module’s settings you can also rename the page with current deals. The description of the page with active daily or weekly deals is shown as static cms block, therefore it can be modified in the backend. Compatibility with ProLables extension version 2.7.13. Prevent crash on multistore Magento instances. Q: hello, can customers subscribe to recieve everyday an e-mail with the deal of the day in it linked to the website? A: Sorry but we don't have such feature. Q: Is it possible to avoid coupon codes at checkout with the daily deals products? If yes how could it be managed. Otherwise it would be a good feature for future releases. A: Current version of daily deals extension does not influence shopping cart price rules in any way. If you want to exclude products in deals from applying coupons you can do this only with conditions of shopping cart rule. Q: Is this extension Mobile Responsive, or does the timer get omitted on Mobile View? A: Yes this module is created as mobile design friendly.